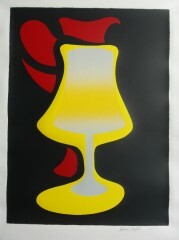 Patrick Caulfield, English painter and printmaker. He began his studies in 1956 at Chelsea School of Art, London, continuing at the Royal College of Art (1960–63), one year below the students identified as originators of Pop art. In the early 1960s Caulfield’s painting was characterised by flat images of objects paired with angular geometric devices or isolated against unmodulated areas of colour. He adopted the anonymous technique of the sign painter, dispensing with visible brushwork and distracting detail and simplifying the representation of objects to a basic black outline in order to present ordinary images as emblems of a mysterious reality. He deliberately chose subjects that seemed hackneyed or ambiguous in time: not only traditional genres but selfconsciously exotic and romantic themes and views of ruins and the Mediterranean. Gradually Caulfield’s attention shifted to the architectural elements to which he had earlier made isolated reference. Caulfield began to insert highly detailed passages in the manner of Photorealism into his characteristically stylised idiom, playing to great effect with ambiguous definitions of reality and artifice. Always a slow and exacting worker, he sustained a high level of pictorial invention. During the 1980s he again turned to a more stripped-down aesthetic, particularly in large paintings in which the precise disposition of only a few identifiable elements miraculously transforms an ostensibly abstract picture through the creation of a vivid sense of place. 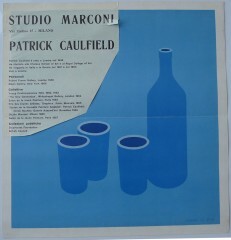 Patrick Caulfield screen print poster for Marconi, 1966.